From your oceanfront balcony at North Shore Villas 802, you can look down to the resort's oceanfront lawn and lazy river. What a way to start your North Myrtle Beach vacation day! Take your fresh cup of coffee to the oceanfront balcony and gaze at the Atlantic Ocean while listening to the waves crash ashore. Your vacation accommodations at this North Myrtle Beach condominium rental include a fully furnished kitchen. There are three bedrooms in North Shore Villas 802. 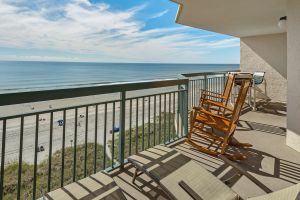 This North Myrtle Beach vacation condo rental sleeps eight people and for your convenience there are three baths in this oceanfront condominium. There is more than 1,450 square feet in this North Myrtle Beach vacation rental, so you can only imagine the space you have to enjoy a North Myrtle Beach vacation whether you are here with your family, friends or golf foursome. Tile flooring, a breakfast bar in the kitchen, balcony access from the master suite and a Jacuzzi tub in the master bath make this North Myrtle Beach vacation rental quite appealing. There is high-speed Internet access in North Shore Villas 802 so you can get online during your vacation and peruse the championship golf courses before you make a tee time. DVD players, washer/dryer unit and more are among the amenities featured in this oceanfront condominium rental. Swim in the resort pool, lounge in the lazy river and splash with the kids in the kiddie pool at this oceanfront resort in North Myrtle Beach, South Carolina. There is a fitness center and a picnic area at this oceanfront retreat as well. Live entertainment theatres, championship golf courses, shopping and dining are around the corner from this South Carolina resort and just minutes away from your fabulous accommodations at North Shore Villas 802.